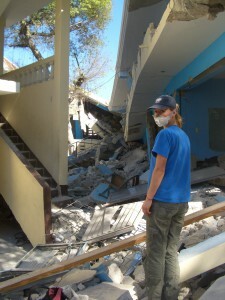 Then Portsmouth MSc student Naomi Morris responded to the Haiti disaster by volunteering her advanced mapping skills. She has since worked in numerous major disaster zones around the world. Unseen by many in the city, hundreds of University of Portsmouth students have given thousands of hours of time and expertise to help the city and region flourish. Among the many volunteers are an artist who redesigned the logo for a small parish church, law students helping those who have been unfairly treated by employers, and a sociology student who helps people trying to claim benefits. Student volunteers work as finance assistants for small local charities, recycle bicycles, help children learn to read, carry out research, offer IT support to those who are struggling, and help staff domestic violence and sexual abuse helplines. They also gave up more than 4,000 hours last year to coach people in sport and give up their weekends to run theatre or social events for children or the elderly. Second-year geology student Daniel Morris volunteered, along with many other UoP students, at a Feeding the 5,000 event organised by Portsmouth Food Partnership, for which volunteers prepared and served 5,000 meals using leftover supermarket produce in a bid to highlight global food waste. 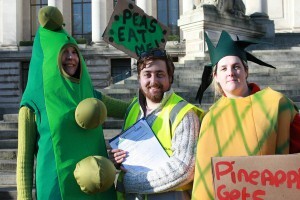 More Portsmouth students than ever are signing up to volunteer, with numbers rising year on year. The university’s students can find a wide range of volunteering opportunities through three different channels. About 1,000 students are members of the Students’ Union Volunteering in Portsmouth (VIP) group which also helps to run the annual Volunteering Fayre and Student Volunteering Week. A further 700 volunteer through the University’s employment and careers office Purple Door; and about 200 volunteer as coaches through the sports department, which has worked with and held activities at almost every school in the city. The wide variety allows students to develop long-term volunteering roles as well as the student-led and one-off community projects. Waqar Younas, president of VIP, who won the Young Volunteer of the Year award at Portsmouth’s ‘Inspiring volunteer’ awards earlier this year, said: “Small differences can make such a big impact on the lives of others and that’s what makes volunteering so important. There are so many amazing projects in Portsmouth but what is more surprising is how many of those have support from student volunteers. Law students volunteer at a free clinic to help advise people on a wide range of legal problems. Purple Door, acts as a link between nearly 200 organisations, including schools, the NHS, Hampshire Constabulary, councils and charities, and students who can give a long-term commitment or who are hoping to find roles relevant to their future careers. 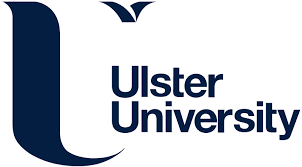 Current roles include helping children at a local school learn to code, becoming dementia support volunteers and mentoring secondary school children. 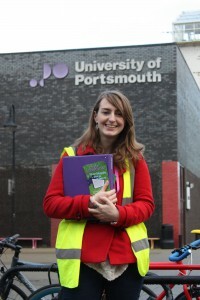 Student Alex Bracey volunteers on campus as part of ‘Student Watch’, a bike crime prevention initiative. The value isn’t just to the city, though, volunteering is also of huge value to the students and graduates. Many say that through volunteering they have grown in confidence, learned new skills, applied what they’d learned in theory to the real world, worked out what sort of work suits them and had fun.